Eli Roth made a family film. That’s weird. Although there is certainly something juvenile about the filmmaker’s work in general. Yes, the Hostel director (and Cabin Fever, The Green Inferno and any number of other hard-R flicks) indulges a sillier side with his big screen adaptation of John Bellairs’s 1973 novel, The House with a Clock in Its Walls. Set in a mid-Fifties slice of Americana (New Zebedee, Michigan), the film lazily crosses Spielberg with Tim Burton by way of Nickelodeon. 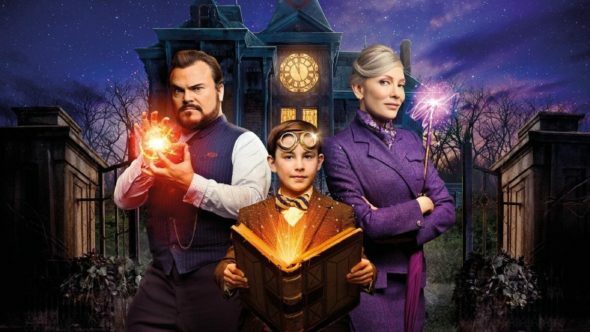 Orphaned Lewis (Owen Vacarro) finds himself in the charge of weird Uncle Jonathan (Jack Black), who is a warlock. The two items most likely to be found in Uncle Jonathan’s big, weird house are his next door neighbor/best friend/fellow witch Mrs. Zimmerman (the always formidable Cate Blanchett), and clocks. Loads of clocks. Why so many? Jonathan likes the ruckus they create—keeps his mind off that one ticking sound he can’t quite locate…that ominous harbinger of something terrible. The house also boasts a number of bewitched items, none of which are given much point or presence as Lewis struggles with the loss of his parents, unpopularity at school, and the sudden realization that he might have just triggered the end of days. Roth and screenwriter Eric Kripke streamline Bellairs’s charming prose. Some updates are sensible, although neutering the novel’s image of powerful women is not one of the more courageous or welcome choices the filmmakers made. They entirely miss the novel’s tone, amplified with intermittent illustrations by the great Edward Gorey: subdued, wondrous yet melancholy. These are not adjectives used in conjunction with the work of Eli Roth. What he substitutes instead is colorful, artificial, sloppy fun. Black—more or less revisiting his role from 2015’s Goosebumps—charms exactly as he always does. Watching the incandescent Blanchett slyly deliver lines and easily steal scenes from Black—and anybody else who happens to be present—is a joy. Vacarro isn’t given much opportunity. His is a story about grief and loneliness. Or maybe it’s about embracing your inner weirdo. Roth can’t seem to decide, and he’s far too sidetracked by the demonic jack-o-lanterns, topiary Griffin and inexplicable roomful of carnival freakshow dummies to pay attention to the story. There is utterly forgettable fun here, mainly thanks to Black and Blanchett, but the intended audience is a little tough to gauge. Things are likely a bit too slow-moving and eventually too wicked for the very young, while teens and adults may be bored by the lack of logic or what passes for humor. Still, if you have a 10-year-old who wants a seasonal scare that’s not too scary, here you go.